In March 2016, an unexpected diagnosis and a desire to make a difference led to the launch of Little Things Matter. With no cure and an unknown length of time, founder Barry Annino channeled his passion into this foundation to create opportunity in Hispanic communities through small-scale, project-based investments that generate significant impact and transform lives. Our year has been filled with life-improving technology and soul-enriching relationships. 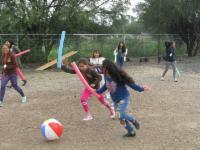 Since launching the Little Things Matter Foundation, we have provided 25 eco-stoves, 30 water filtration systems, planted sustainable gardens and orchards, hosted a Three Kings Day community celebration, and capped off our year with a summer camp at Casa Hogar Corazón Valiente, an orphanage on the outskirts of San Miguel de Allende, Mexico! Each project yielded not only tangible impact–life improvement, education enrichment, and community engagement, but, most-importantly dispensed grace and compassion. Our highlights–joy bursting into smiles as children’s names are called and their uniqueness recognized at Camp Corazón Valiente. Aurora Ramirez, a tough cookie, grinning as she explains how her multi-generational family of fourteen gathers around her as she cooks tortillas on her eco-stove. Healthy fruits and vegetables from gardens filling lunch plates at Casa Hogar Corazón Valiente. Educational through art, music and literacy, made available through Ojala Niños, enriched 100 indigenous children in San Miguel de Allende, Mexico. These are just a few of the little things that made a difference in the lives of others through the resources provided by Little Things Matter Foundation. Thank you for your partnership with Little Things Matter Foundation and making a difference in the lives of others. Fruit trees, vegetables, herbs, berries and corn were planted at Casa Hogar Corazón Valiente providing fresh, healthy food and revenue opportunites for excess harvest sold at local organic markets. Eco- stoves reduce the use of wood by 90%, save women time from gathering wood for cooking, provides safe cooking, lowers incidence of burns, and improves health by reducing the amount of inhaled smoke from open-fire cooking. Another little thing that makes a big difference in the lives of others! Seeing hope in action at Ojalá Niños, a non-profit year-round program that offers training in art and culture to 100+ indigenous children in the rural community of San Miguel Viejo in the state of Guanajuato, México. Watching them explore their strengths through art, music and literacy reminded us that the human spirit can flourish amidst the worst conditions, so long as there is opportunity. Skill development allows some of the older children to earn money from their art. Every piece they get into the world delivers precious financial support and a ray of hope. We were humbled to experience how deeply little things matter. The ceramic water filtration provided to the community of San Miguel Viejo is an inexpensive answer to potable water concerns. The filters produce approximately 24 liters/day (enough for a family of 5), require minimal maintenance, last 2-3 years, and can reduce the cost of potable water. That's a little thing that matters! Ojalá Niños and Little Things Matter hosted a community event in San Miguel Viejo, a rural, underserved area of San Miguel de Allende, Mexico. Life-improving technology were shared through demonstrations of Eco-stove cooking, water purification and irrigation drip systems– all available to members of the community. 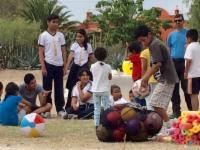 Children's games and activities were hosted by Antioch youth group and delicious food prepared by the mothers of Ojalá Niños added to the festivities. 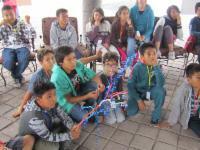 What began as a simple vision in a simple conversation under a palapa last fall launched into a week-long summer camp for the children that reside at Casa Hogar Corazón Valiente (House Brave Heart) and the surrounding community. Children ranging in age from 4-17 joined in songs, art journaling, games, creation science, healthy snack preparation based on the theme, Be You Bravely! Each day unfolded with stories, discussions and experiences that highlighted the majesty and unique purpose of creation. Brave Heart flag creation and lessons on the majesty of all creation. Art journaling and outdoor games. Friends from near and far gathered in San Miguel de Allende last March to celebrate founder Barry Annino's birthday and to tour the life-giving projects that impact communities and improve well-being – creating big impact through small investments. We would like to offer our sincere gratitude to our partners and organizations that invested their time and talent, providing opportunities for Little Things Matter to make a difference in the lives of individuals, families and communities. Little Things Matter provides small-scale project-based investments that generate opportunity for those aspiring to improve quality of life for themselves and others by providing resources that are not obtainable otherwise–transforming communities and connecting lives. #GivingTuesday is a global giving movement that has been built by individuals, families, organizations, businesses and communities in all 50 states and in countries around the world. Millions of people have come together to support and champion the causes they believe in and the communities in which they live. Save the date and consider giving to little things that matter! 44 buildings and at least 225 people are dead after a magnitude-7.1 earthquake struck central Mexico Tuesday, Sept. 19. We are grateful that the communities we serve in San Miguel de Allende are safe yet, we grieve with other communities suffering from disasters and struggling to bounce back. Join us in praying for those affected by the earthquake.